The Seven Deaths of Evelyn Hardcastle by Stuart Turton is an easy novel to sum up superficially, but on paper it’s as complicated and compelling as they come. A mash-up of Agatha Christie, Shirley Jackson, Quantum Leap and Groundhog Day, this is a murder mystery with not one, but dozens of twists. I’m not usually into crime but I made an exception for this and I’m so glad I did. It’s a book that combines genres to mind-bending effect. In true Christie fashion, there’s a cast of dubious characters at Blackheath – some of whom Aiden inhabits. This play on perspective is really clever. We not only see the action unravelling but we also see events from multiple angles – each time through a different lens. Aiden becomes a duality. He has his own mind and that of his host which sometimes leads to conflict. Although this constant switching occasionally diminishes the emotional pitch, it’s handled so expertly that you don’t want to dissect the experience. Aiden develops as a character too – a feat considering the multiple personas involved. There are plots and there are labyrinths. After reading this, I half-wonder if I’ll ever be satisfied with a normal structure ever again. To give you an idea of the complexity, it took Stuart Turton three months to map The Seven Deaths of Evelyn Hardcastle on a spreadsheet. I can guarantee that even if you predict a few twists, you won’t guess everything. The various time lines add an extra layer of confusion. There’s a real gaming element to the narrative too which is explored in this article by Eurogamer (don’t look up the games that Turton cites btw!). I have a real urge to reread the book with a stack of post-its and link all the clues. The decaying Blackheath Estate is almost a character in its own right. Rotten and sprawling with a murderous history, it contains a web of secrets – much like its inhabitants. I often felt disorientated when trying to work out where I was and I’m sure this was deliberate. In many ways, the setting reminds me The Haunting of Hill House by Shirley Jackson and The Shining by Stephen King. Although the estate isn’t portrayed as a living entity, its sinister presence overshadows the entire book. Without giving anything away, I think one of the reasons that this novel stands out is because the tale goes beyond the surface action. Love or dislike the ending, it shines a light on the shadowy interplay to reveal a shocking new angle that will make you question everything. Personally, I thought it was the perfect choice even though one aspect didn’t quite click for me. A high concept book like this needs an equally spectacular explanation and this delivers in massive style. 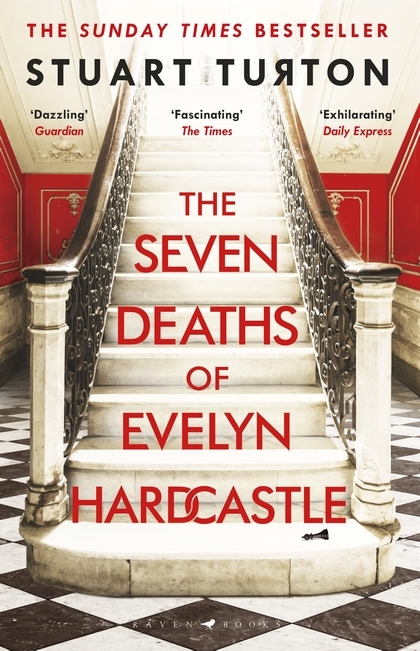 The Seven Deaths of Evelyn Hardcastle has to be my favourite read of 2019 so far. It’s one of those impossibly bonkers stories that many authors would like to write but wouldn’t know where to start. Thank goodness that Stuart Turton decided to push through the pain barrier and make this story a magnificent reality. If you enjoyed this review, check out our other book reviews. I have this on my TBR, need to read it when I can really concentrate on it I think. It does need time to fully digest it all, but it’s still very readable. I hope you enjoy it! I’m currently reading this and so far I am loving it! I’m glad you did as well – great review! It totally lived up to the hype for us. Will be intrigued to see what you think of the ending!